With Habu, you can set up flexible spaces that allow you to check members in and out of your hub's various workspaces and other flexible use areas. This means you can track member usage of your space with the click of a button. This article goes over how to set up a flexible space, checking a member in and out of the space, and editing past check-ins. It also describes some of the interactions between check-ins and other parts of the Habu platform. Member Check-ins are performed in the Check-ins section on the Bookings screen. In the Check-ins section you will see all your Flexible Spaces, which we cover in the next part of the article, listed along with a green plus button and a capacity indicator. The green plus button starts a new member check-in and the capacity indicator lets you know how many seats you have left in your Flexible Space. 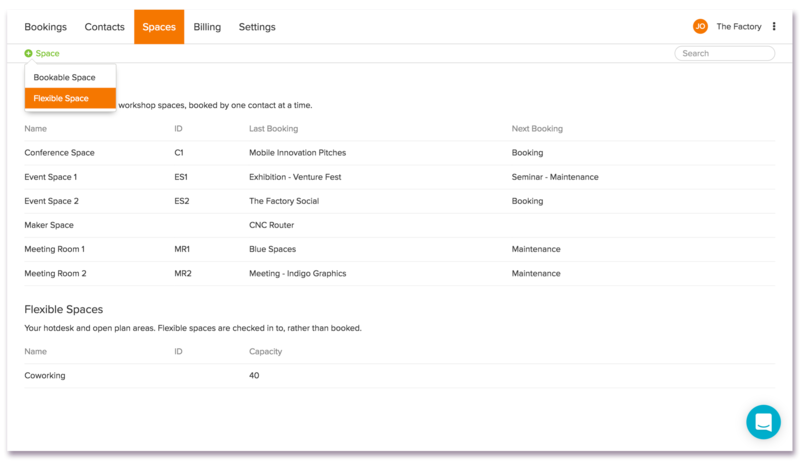 The sidebar content is dynamic, showing you details about what you've selected on the Bookings screen, whether it be a space booking or a member check-in. In the case of member check-ins it will show you the member's name, organization, contact info, and start/end times. Before we can begin checking members in and out, and therefore tracking their time in our space, we have to set up a Flexible Space for them to check into. Flexible spaces differ from Bookable Spaces in that they are used by multiple people at the same time and that they aren't reservable. To add a new Flexible Space, click to add a new space at the top of the Spaces screen and choose the Flexible Space option. You can add several details about your space, which are explained below. We'll explain hourly and daily prices in more detail later in the article. Once you've filled in your desired details just click to save your space. You can edit these details at any time. To check a member into a Flexible Space, navigate to the Bookings screen and click the green button in the Check-ins section next to your Flexible Space. This will pull up a list of members for check-in, visible in the Check-ins sidebar on the right side of the screen. Scroll through the list to find somebody or search for a specific person. When you select a member from the list, Habu will display some of their contact details and the grey Check In button. Click on the grey Check In button to check the member in. 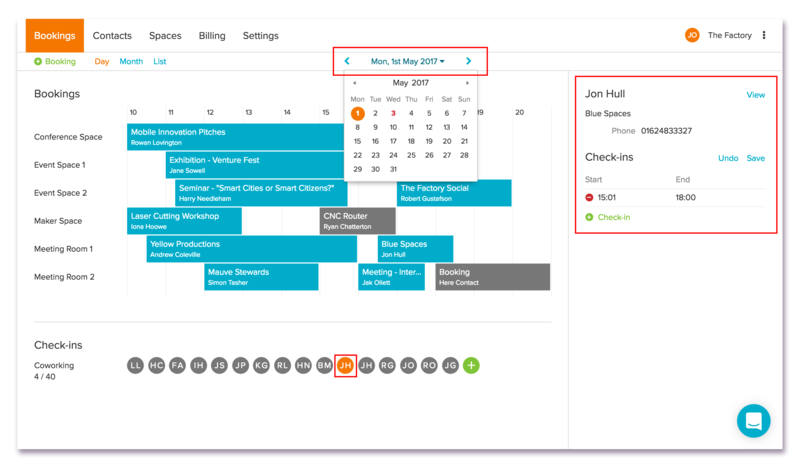 A timestamp is automatically added to the member's account and will appear below their details in the Check-ins Sidebar, as well as on their account page. Their member icon will also appear in the main Check-ins section, color-coded based on their status. To check a member out, select their respective member icon and click the blue Check Out button from the sidebar. A timestamp for the checkout time will be applied in the same way as the check-in timestamp. If the space was chargeable, either a charge will be created and added to the member's account or the equivalent allowances will be deducted from them. Space usage is calculated based on the total time the member was checked in rounded to the nearest quarter hour. Rounding always happens after calculating the total checked-in time for the day, not for each individual check-in. This prevents rounding errors which would cause a miscalculation when charging members. If a member has another check-in later in the day, Habu will recalculate the total checked-in time, round to the nearest quarter hour, then recalculate the charges for the day. 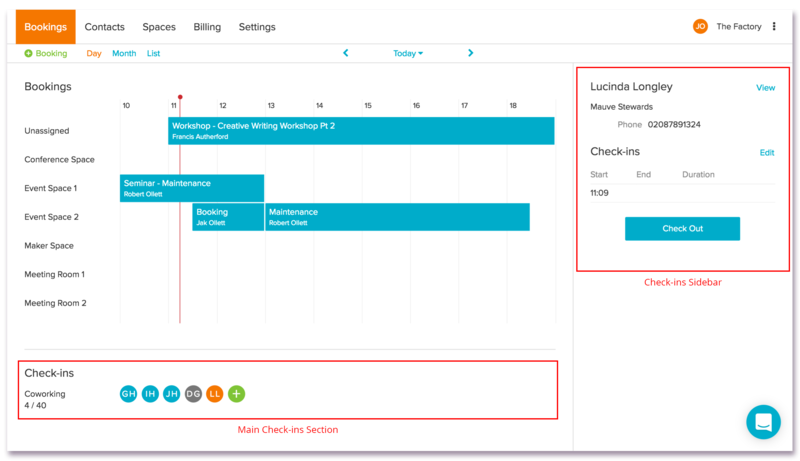 You can do some pretty creative things with Flexible Space billing based on how you set your daily and hourly prices. Let's go over this in detail. If your hourly and daily rates are left blank or set to zero, Habu will not generate any charges for member check-ins. Your Flexible Space is considered free in this case. If you set only an hourly price for your Flexible Space, your members will be charged the hourly rate for the total amount of checked-in time for that day. Total checked-in time for that day is rounded to the nearest quarter hour for calculating chargeable time. *Note: Habu still calculates time rounded to the nearest quarter hour in this case. Which means that if a member is checked into the Flexible Space for less than 7 minutes in total for the day, the time will round to zero and no charges will be created, nor would any day passes be used. This is useful in the instance where members come into the space only to grab mail or quickly print a document. When both an hourly and a daily price are set for a Flexible Space, Habu will default to the hourly rate for a checked-in member's total check-in time unless doing so would exceed the cost of the daily rate. If that happens, Habu will use the daily rate for that day's check-ins. All check-ins are editable in Habu. In fact, you can even create and edit check-ins in the future. How fancy! Once you've navigated to the day with the check-in you're looking for, click the respective member icon to bring up that member's check-in details for that day. You can click to edit an existing check-in time or you can add a completely new check-in for that day. Habu will prevent you from making illogical changes like setting a check-out time that happens before the check-in time, etc. *Important Note: some complications can arise with charge calculations if you edit a check-in where the resulting charge has already been invoiced. Therefore, it's best not to edit check-ins that have already been invoiced or paid. We are currently working on some improved logic that will handle this rare issue more smoothly. In the event a member is accidentally not checked out, Habu will automatically check them out for you. At midnight, Habu will check to see if there are any members still checked in at your space. If there are, Habu will check them out and set their checkout time based on your space's closing time set in the Settings section in the admin panel.